Anyone in line by 7:00 pm will be able to cast a vote, even if takes past 7:00 to do so. PREVIOUS: Early indications point to a heavy voter turnout in today’s elections. 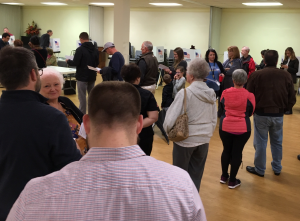 In Roanoke County, some extra waits — more than 30 minutes this morning, for instance at the Castle Rock precinct near Cave Spring Middle School. 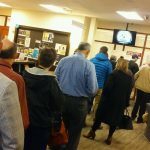 The county’s Voter Registrar’s office says one reason for the lines is that voter roll laptops crashed today, so they are now using paper poll books the rest of the day. Voters in the Roanoke area will select candidates in one of three Congressional districts in the region: the 5th, 6th and 9th Districts. Voters living in the House of Delegates 8th District will also take part in a special election to fill the seat left vacant when Greg Habeeb left his position in August. Senator Tim Kaine is seeking a second term, facing a challenge from Republican Corey Stewart. There are also two proposed amendments to the Virginia Constitution on the statewide ballot.